Yamaha’s Pacifica Series is the go-to collection for many guitarists who want something familiar at a price that screams value. The entry-level model of this series – the PAC012 – is incredibly popular with beginners, as well as guitarists looking for an affordable axe to add to their collection. Why? Let’s find out! The PAC012 is a great example of a well-designed electric guitar – seriously, for under $200, it rocks. 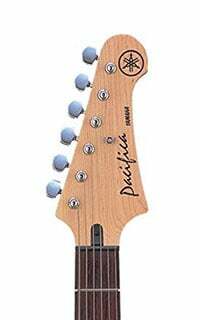 As with any model in the Pacifica Series, it features the familiar Strat-style double-cutaway body, albeit with a more curvaceous and slightly edgier feel. Yamaha keeps the cost down by using solid agathis (similar to basswood) for the body, which is covered in a high-gloss finish in a range of cool paintjobs – Black, Metallic Blue and a vintage-inspired Old Violin Sunburst. All feature a plastic pickguard. 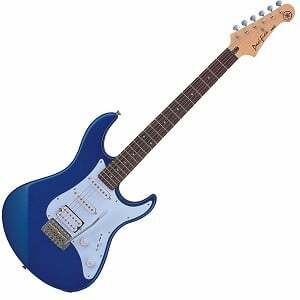 Similar to any Strat-style guitar, it features a 25.5” scale length with a sturdy bolt-on neck. This is made of maple and is topped with a 22-fret sonokeling fretboard – again, a cost-cutting measure from Yamaha, but one that is very acceptable at this price. 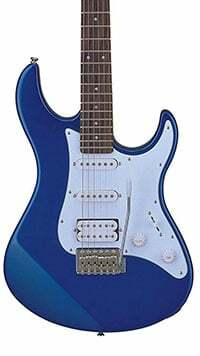 The playability is very good for a budget guitar, with the satin-finished neck feeling just right, while the fit and finish is commendable for a production model. While the design of the Pacifica Series is clearly inspired by the Stratocaster, the electronics on offer on the PAC012 do differ somewhat. Mainly in the bridge position, where you’ll find a humbucker to complement the single-coils at the middle and neck. This trio of pickups are all Yamaha-designed and pretty basic in their makeup but do a good job of voicing this budget guitar. The controls on offer are simple too, which is another draw for beginners, who only have to get to grips with a master volume and master tone knob, as well as a five-way pickup selector switch. The PAC012 also comes with decent sealed chrome tuners that keep the guitar in tune, while a vintage-style tremolo bridge (with accompanying whammy bar) offers onboard vibrato at the flick of a wrist! The overall tone is very applaudable for a model barely scraping two hundred bucks. It probably won’t blow you away with power – especially if you’re not a beginner – but there’s plenty of worth in the PAC012. While the pickups are stock, they deliver clear sounds with a decent output and having three of them gives you versatility, with plenty of scope for different tones. In particular, the beefy tones you can find on the humbucker will prove very useful for rock and metal players, at least when compared to the three single-coils you’d find on a typical entry-level Strat. Yamaha, we’re impressed. If this is the introduction to the Pacifica Series it’s obvious why this collection has become so popular. There are many highlights to the PAC012 – design, tone and price – and it will appeal to experienced players looking for a knock-around guitar as much as a complete beginner on the hunt for their first axe. For more info about the Yamaha Pacifica Series PAC012, click here. For more good beginner guitars, click here. Great review. Looking for an entry level electric guitar. I think i’ll go with the Yamaha Pacifica 012 after reading this. Cheers. Where is it made in ? What is the best country ? Why does almost every guitar reviewer assume that people want to get a dirty, overloaded sound out of an electric guitar? What does it sound like with clean tones?